Nothing is easier than selling a product you yourself have already tried and are excited about. Take every chance to familiarize yourself with what goes on in the tourism industry. For, setting up a career in tourism, you should be passionate about it. There are many choices of where will you end up as ultimately. This includes becoming a Travel Agent, likely, a Travel Consultant, Hotel Manager, Spa Manager, Tour Operator, Event and Conference Organizer, Tour Guide, Executive Chef, Sommelier, etc. This article, further, will also tell you about how to become travel agents. The first and the foremost thing in consideration to get into the Travel Consultant business is getting yourself educated in this field. You may get a travel agent course. Travel agencies prefer well-learned employees over the formally non-educated ones when it comes to landing a good job. After a travel agent course, you also get training in the field of work from the school you graduate or the travel agent course and this is helpful to know more about the work you will be doing after. An associates or bachelors degree in this course goes a long way in setting up the platform. This all thus makes you eligible for getting travel agent jobs as well as other travel and tourism jobs. A career in tourism is fine but to thrive in the travel industry, you have to have a passion for what you do. Not that it’s difficult to fall in love with the exotic places around the world, but a travel consultant should also be passionate of learning continuously, always staying educated and up to date on the industry's latest developments, and helping clients reach their goals to the best of their ability. The top 10 skills and qualities required for a travel agent should be mastered before starting a career in tourism. From conducting research interviews with the client’s employees to managing the team and stakeholders, writing business proposals and delivering presentations, effective communication is highly important in consulting work. So often projects break down or stagnate because of a lack of effective communication. Being a strong communicator will set you apart from the rest and will quickly gain you such a reputation. A career in tourism thus requires good or great communication skills as customers from other nationality also come in the role while you will be working. Travel Consultants are great planners. The skills and qualities required for travel agents are juggling calls, bookings and communication is an everyday balancing act for them. Their responsibilities include arranging flights, processing payments, securing accommodation, negotiating deals, sending tickets and advising clients. Needless to Travel Consultants must be able to multitask and thus being highly organized is one good vice every Travel Consultant must build. Technical skills for a travel agent are important. Keep a tab on what goes on in the IT section and also work towards getting knowledgeable about the other IT skills themselves. 4. Getting Proper Education in that Field. Get yourself formally educated about the field that you will be entering into. This helps in loads of ways for getting clear with the work that you will be undertaking, having know-how about what type of work it will and other matters. Formal education in this thus goes a long way in preparing you for the industry and is an essential thing you should have. It can be quite daunting having to assert yourself when you are new to the job or organisation. But showing conviction and commitment to your own ideas, as well as the ability to follow through, is highly important in consultancy. Of course, confidence comes with experience, so it is vital to be just as an effective listener. Learn from your peers and offer to support them in realising their ideas if you believe in them and that it will produce great results for the project. Doing exactly what you say you will do sounds obvious, but is essential for building trust and credibility in your team. These are some great tips for travel agents. This is one quality every travel consultant should definitely harbour. Many a time, customers come with great enthusiasm and tell all they want to visit and have fun about where they will be going on the vacation to. If you as a travel agent do not listen carefully, it is surely about to make some problems and this will be a bad thing for your career. Take care and do garner a good ability to listen. If you are that type who skimps over details, you are not capable for the job of a travel agent. Just forget it. As a travel agent, you will surely and incessantly be dealing with name spellings, passport numbers, birth dates, travel dates and many more things. If you do not pay attention to the detail, it will be a disastrous situation for your customer in some cases. So, take care and make sure your attention to details is brilliant. This quality is a must for selling what you are offering your customer. Persuade them to spend more and that a little more expensive package which is sure to give them the whole luxury of the trip or the vacation they have chosen and are going to soon. Good persuading skills go a long way in making good money for your business. Do not forget to set the charm though. Administration skills are a great thing for one working as a Travel Agent. This makes a good person out of you. Your customers will be attracted towards you and you will have good relationships with those you served. Being Internet savvy is the best quality skill a travel agent must obtain. Indulge and get yourself in travel agent jobs. This helps him in going a long way about getting the whole picture of what goes around in the industry, what packages are available, how he can make them better and even more. There are limitless online resources and information available on travel and the related topics. Having knowledge about all is a great writ and thus will lead you in getting more packages delivered to the right customer that sought your service. These are the skills and qualities required for a travel agent. One of the most important things in selling travel is to get to know the customer as well as you can. The more you can find about the wishes of the customer and what he needs, the better you will have the way to serve him the desired product. If you do not know the person who you are talking to and what they exactly are, the harder will it be for you to make them happy. It will be really hard for you to deliver them the product they will absolutely love. A great tip is to try asking more question and get the answers out of them that way. So, get to know the customer and his side of the story, even more, so that what you deliver him will really be bought and will go a long way on making him happy. So, a career in tourism does demand all this from you as doing travel agent jobs and other work. Moreover, write down customer experiences, go to travel shows, expos, product training and social events. Ask more questions to the company representatives and let them know you are interested in getting to know the product even better. Keep those business cards and don't forget to hand out your own. Travel and tourism jobs help to get you more experience in the field that you will be entering and making a career out of. What goes on in the market, fresh news, new deals and more so about new technologies do become and keeping tabs on these is a must for any Agent. Never should you leave this ever-changing world of opportunities. What goes around does come around and making money isn't as easy to work. Sell more packages, make more deals for the customers you are handling and have good knowledge of what goes on in the market. All this will lead on and will surely go a long way in making you a good, reliable Travel Agent. Selling travel to a group of people is a little bit more challenging than other work of any Travel Consultant. In some cases, they do not have the same idea of what they want to do! There are thus many skills needed for a travel consultant while on such a work. When this group ends up at your travel desk, you should leave no chance and go on with your charm in bagging that vacation package off for them. Be prepared for anything as they may have different budgets and or different tastes and rounding off will be a little bit of a task. The last point is if you lose here, they are never coming back for you and this will be a big blow for your career as the travel agent. At Travind Institute of Travel and Tourism, get oneself trained by industry experts and professionals.We at Travind provide top Travel and Tourism courses with complete practical knowledge applicable in the Industry today. You can opt for our Institute Courses after 12th or Graduation. 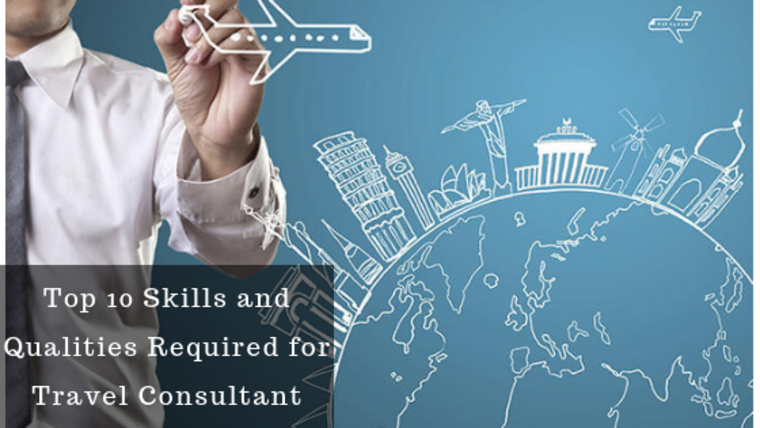 We also take care of the top skills and qualities required for a travel consultant.